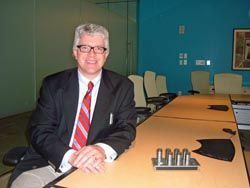 Mike Askew, senior vice president of Fidelity Center for Applied Technology, where the Strategy Conference Room recently added a Revolabs Solo Executive wireless microphone wireless system.BOSTON, MA-Fidelity Investments, one of the world's largest providers of financial services, recently opened its new Fidelity Center for Applied Technology (FCAT). Located at 245 Summer Street, the company's new briefing center includes several training and meeting facilities designed to keep the company at the forefront of the financial services business. As part of this ambitious project, the new company facilities include a small conference room-known as the Strategy Conference Room. The Strategy Conference Room, which opened in December 2006, was designed as a teleconferencing facility for Fidelity's senior technology management. According to Mike Askew, senior vice president of Fidelity Center for Applied Technology, "FCAT serves as a bridge, linking Fidelity's technology resources with business executives who seek practical high tech solutions to critical business issues. Our new executive conference facility was designed and built expressly for the company's senior management. While the room is designed to accommodate eight to ten people, actual sessions typically see about six to eight participants. This is a truly global conference room, with teleconferencing facilities that routinely support communications with our offices in Europe and Asia in addition to those throughout the United States." Presentation facilities in the Strategy Conference Room include a PC, an NEC NP40 2200 ANSI lumens projector, a drop-down screen, as well as an NEC 50-inch PlasmaSync plasma display. At the heart of the room's videoconferencing setup is a LifeSize HD Video Communications system supporting 1280 x 720 pixels at 30 frames per second with two Sony cameras tied to the system. A ClearOne XAP 400 with an integrated telephone interface handles the audioconferencing side of the setup. An Extron MXP series media presentation matrix switcher with an MKP series controller facilitates content selection and routing. Ceiling speakers are provided for sound reinforcement. For its wireless microphone system, executives had previously struggled with excessive ambient noise and, as a result, were searching for a setup that could minimize disturbances. "One of the most distracting aspects of our previous system was the ancillary noise that made it extremely difficult to understand the conversations that were taking place," explained Askew. After conducting an extensive evaluation program, the company elected to install an eight-channel Solo Executive wireless microphone system from Revolabs. Askew said, "Audio quality has improved dramatically, and ambient noise is minimized. These mics have made a dramatic difference for us."